Subiect: Non-issue of Pension slip by banks. 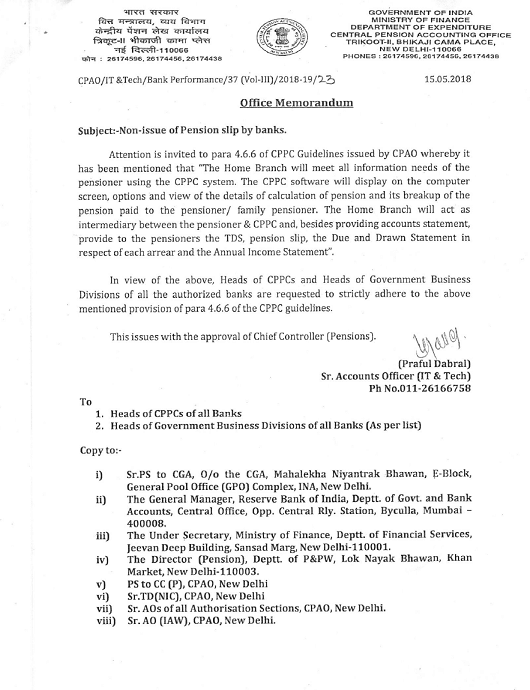 Attention is invited to para 4.6.6 of CPPC Guidelines issued by CPAO whereby it has been mentioned that “The Home Branch will meet all information needs of the pensioner using the CPPC system. The CPPC software will display on the computer screen, options and view of the details of calculation of pension and its breakup of the pension paid to the pensioner/ family pensioner. The Home Branch will act as intermediary between the pensioner & CPPC and, besides providing accounts statement, provide to the pensioners the TDS, pension slip, the Due and Drawn Statement in respect of each arrear and the Annual Income Statement”. In view of the above, Heads of CPPCs and Heads of Government Business Divisions of all the authorized banks are requested to strictly adhere to the above mentioned provision of para 4.6.6 of the CPPC guidelines.